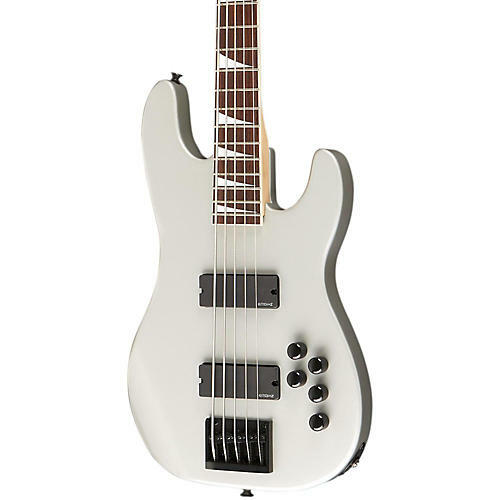 The David Ellefson CB-XV 5-string X-Series bass is a formidable addition to the Jackson bass family, bearing the personal stamp and distinctive features of the fleet-fingered Megadeth bassist. From its earth-shaking dual humbucking pickups to its lightspeed compound-radius fingerboard and sophisticated onboard controls, the CB-XV is pure Jackson and pure Ellefson in sound, feel, look and value. Some features include an alder Concert Bass body with a gloss finish in Black or Quicksilver for killer looks. Its bolt-on quartersawn maple neck with special profile shape, ivoroid binding and oiled finish give it a solid yet smooth, playable feel. The rosewood fingerboard with 21 jumbo frets and shark fin inlays, and ivoroid-bound black headstock with '90s-style Jackson logo give the CB-XV an unmistakable look. The EMG humbucking neck (HZ40N) and bridge (HZ40B) pickups and EMG BEQ3 active preamp are the perfect set of electronics to help you dial in the sound you want. Domed volume, three-band EQ and blend control knobs, high-mass five-string bridge, black hardware, and David Ellefson silver "Fallout" logo on the truss rod cover round out the awesome looks and utility of this radical 5-string. Case sold separately.